There are so many world class outdoor places to explore in the Carolinas, it’s easy to be overlooked. Even when you’re an 18,000 acre lake of amazingly clear water bordered by the Blue Ridge Mountains with easy access to dozens of noteworthy hiking trails. 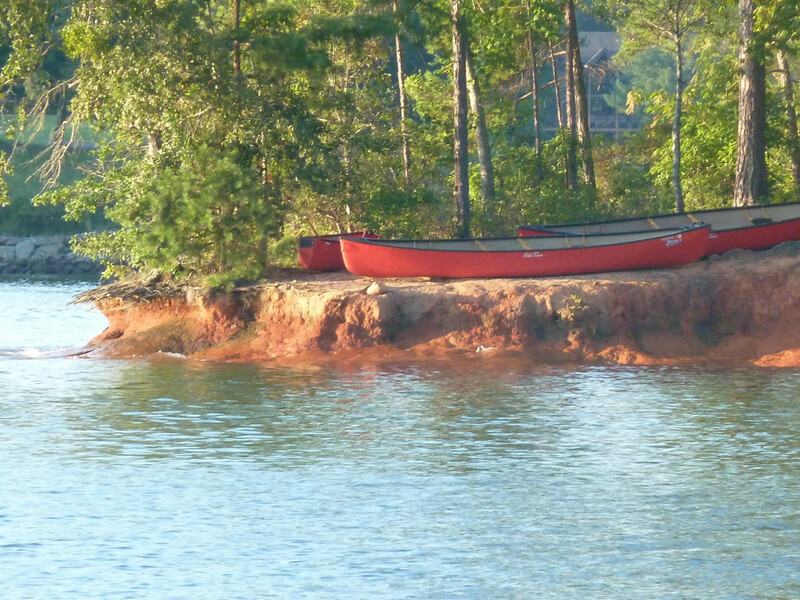 Such is the fate of Lake Keowee in the western portion of South Carolina. While only 2-2.5 hours away from downtown Charlotte, this area is often overlooked by Queen City residents who are more familiar with the larger parks and higher peaks of North Carolina. But for easy access, diversity of activities, and stunning beauty, it's hard to ignore this lake and its surroundings. Perfect for a fall weekend getaway. 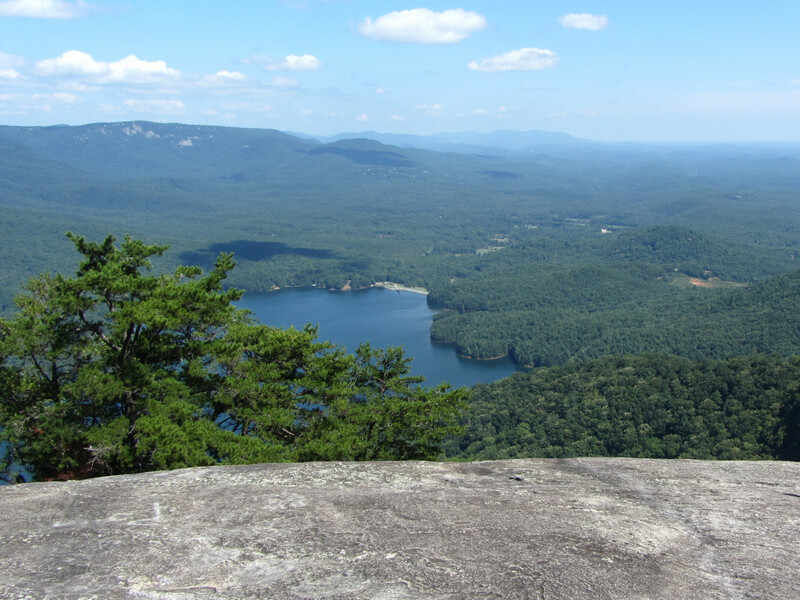 Placed on the eastern short of Lake Keowee, Keowee-Toxaway State Park is right smack in the middle of an epicenter of outdoor activity. Easy access to the lake and several great blue-ridge mountain hikes make it the perfect launch pad for a weekend of fall exploration. 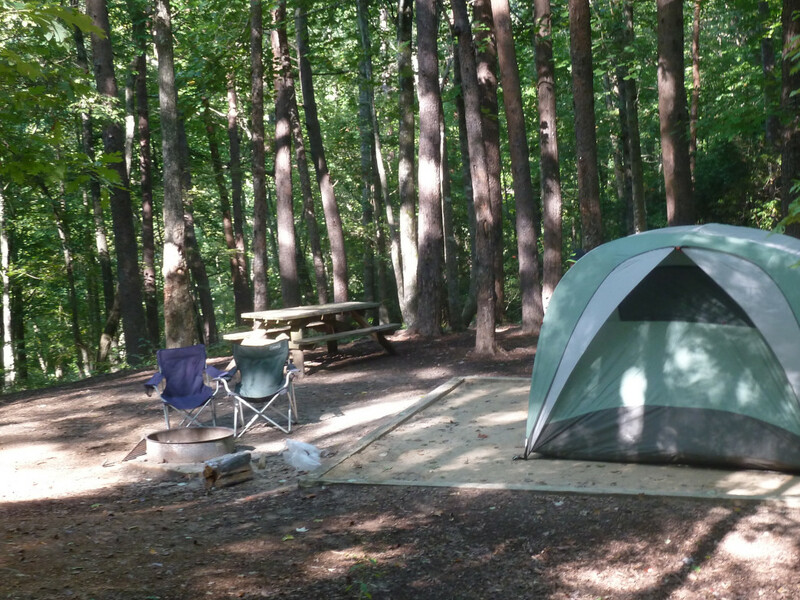 The modestly sized campground provides a surprising diversity of options and amenities. The main campground holds 10 RV and 14 tent sites. There’s also one, three-bedroom cabin for rent that includes its own boat dock. To get even farther away from it all, there are also 3 back country campsites on the lake shore accessible by hiking trail or canoe/kayak. Running water, full bathrooms, and, get this, hot showers are all located in the main campground. There’s a gas station/convenience store about 7 miles away (in between the campground and Table Rock State Park) where you can grab firewood, ice, and the bacon cheese flavored pretzel bites. 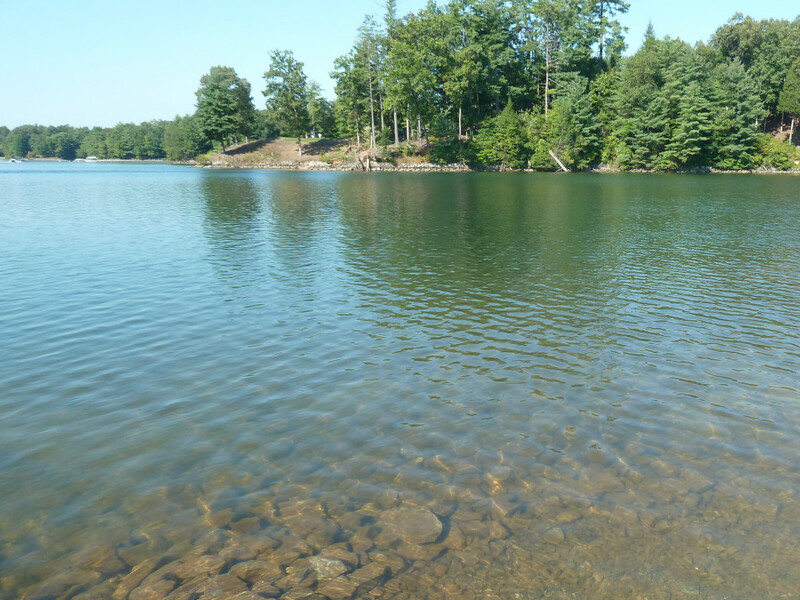 The lake is accessible from the campground via a half mile foot path. Two other trails within park boundaries add a total of 5.5 miles of walking options. The park also provides a boat launch for non-motorized craft. If you’ve gathered up a group to take with you try to get tent sites T1 – 3. They are very close together, T-3 being the more private one, tucked behind the others. An overhead map of Lake Keowee resembles a horribly failed attempt at a tree shaped Christmas cookie. The 300 mile jagged shoreline, however, provides countless little coves to duck in and explore. Take a left out of the State Park launch and you can easily access several of these coves. Most are capped with a small, sandy beach area perfect for parking your ‘yak. These little hideaways are an awesome place for a bit of swimming in the surprisingly clear lake water. Much of the lake shore near the launch is protected by the state park with several large houses and a golf course peeking out from the trees on the western shore. Tuck into a cove in the late afternoon for an ideal way to enjoy an autumn sunset. 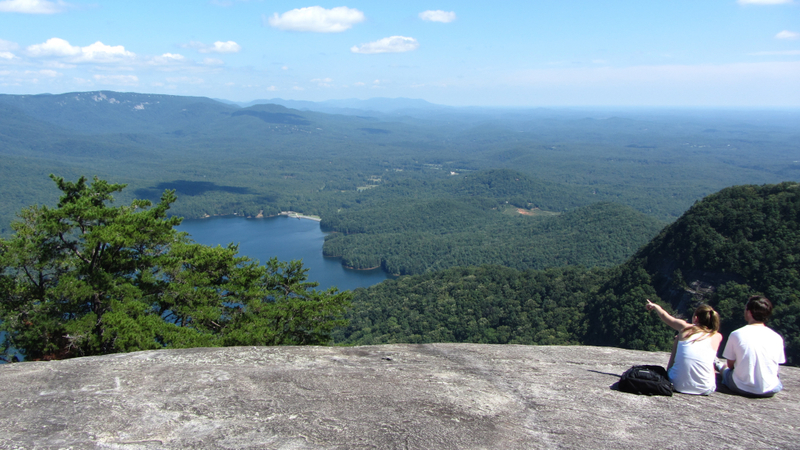 Keowee-Toxaway State Park is an easy drive to loads of hiking opportunities. One of the closest, Table Rock State Park , is 12 miles from the campground, and it features a trail system with about 15 miles of trails. The favorite option here is of course the hike up to Table Rock itself, where you and your hiking partners can enjoy sweeping views of the Blue Ridge mountains sprawling out before you. And in the fall, the changing leaves put on a magically colorful show.